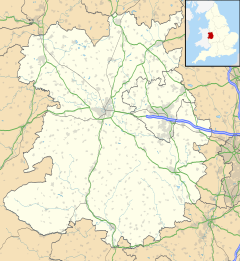 Cosford is a village in Shropshire, England. Brewer's Dictionary of Britain & Ireland suggests that the name originates from the Old English of Cost, which means Excellent (Ford). It lies between the town of Shifnal and the large village of Albrighton, in the parish of Donington. It has a railway station on the Wolverhampton to Shrewsbury Line. At the 2011 Census Cosford was listed as part of a Shifnal ward. Cosford Grange and Cosford Mill, the sites of which were both located on Albrighton Brook, are now quite remote from the village of Cosford in terms of access because the expansion of the airfield required land from the formation of Worcester Road (which used to connect the A41 and the A464 in a north/south direction). Also on the A464, is Cosford Pool, created to help power the mill and Cosford Pumping Station, built by the Wolverhampton Corporation in 1857. The listed buildings of the pumping station are still there and operated by Severn Trent Water. Cosford Brook runs from where Ruckley and Neachley Brooks meet just west of RAF Cosford. This is the local name as it remains Ruckley Brook and upon reaching Cosford Bridge on the A464 it becomes the River Worfe. The village is dominated by RAF Cosford, which is home to the Royal Air Force Museum Cosford, a major visitor attraction and heritage centre. The base itself is built on former farmland, with the outdoor athletics arena being on the site of Sydnal Farm's buildings. The village (and RAF Base) is split into two by the A41 road which runs from London to Birkenhead. The A41 has a junction with the M54 motorway just 1 mile (1.6 km) north of Cosford. Nicholas Witchell (born 1953 in Cosford) journalist, newscaster. Royal correspondent for BBC News. Suzi Perry (born 1970) Television presenter, was born in the village. ^ Ordnance Survey: Landranger map sheet 127 Stafford & Telford (Ironbridge) (Map). Ordnance Survey. 2010. ISBN 978-0-319-22851-7. ^ Ayton, John; Crofton, Ian; Cavill, Paul (2005). Brewer's Britain & Ireland. London: Cassell. p. 276. ISBN 0-304-35385-X. ^ "Area: Donington Parish". Office for National Statistics. HM Gov. Retrieved 27 April 2016. ^ Hough, E; Barnett, A J (1998). "GEOLOGY OF THE BECKBURY AND WORFIELD AREA" (PDF). NERA. British Geological Society. pp. 1–33. Retrieved 28 April 2016. ^ Ordnance Survey: 2007 Reprint sheet 127 Stafford & Telford (Map). Ordnance Survey/Cassini. 1921. ISBN 978-1-84736-182-0. ^ "Cosford Grange, Shifnal, Shropshire, England". Parks and Gardens UK. Retrieved 28 April 2016. ^ "Cosford Supply Works, Albrighton". British Listed Buildings. Retrieved 28 April 2016. ^ Robinson, D H (1982). The Wandering Worfe. Albrighton: Waine Research. pp. 30–31. ISBN 0-905184-06-8. ^ Brew, Alec (1996). Albrighton & Shifnal. Stroud: Chalford. p. 60. ISBN 0-7524-0384-2. ^ The Royal Air Force handbook. Whitehall, London: Crown. 2006. p. 197. ISBN 978-0-85177-952-2. ^ "About - SuziPerry.com". Retrieved March 22, 2015. This page was last edited on 21 July 2018, at 00:48 (UTC).